SoftPlanet makes it possible for everyone to get free Optimizer Pro download directly from our servers. There is no registration needed for downloading. Most of you have had issues with your systems, which run too slowly. In some cases, your Windows Registry is the reason for this. Basically, it stores settings, options, and other stuff for Microsoft Windows. Unfortunately with time its size grows dramatically and it can be cluttered with invalid data. This could be a major reason why your PC runs so slowly. Optimizer Pro 3.2 can keep your Windows Registry in good shape and respectively the Windows operating system itself. 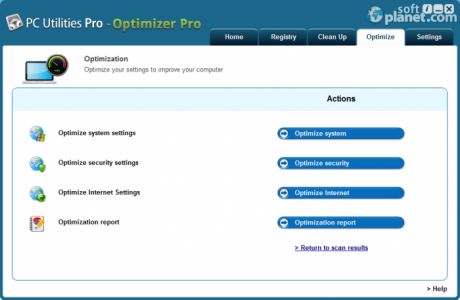 Optimizer Pro 3.2 is capable of keeping your PC clean, secure and running at top performance level by removing all junk files, online activity history and invalid shortcuts. This software utility can also provide you with comprehensive scan reports, where you can see the number of issues divided into several categories. It even allows you to set performance and optimization adjustments and management of the startup applications. Optimizer Pro 3.2 comes with a great tabbed interface. In my opinion, it is very intuitive and user-friendly, not only because of its structure, but also because of its single click process. The main feature categories are divided into 5 different tabs. The Home tab allows you to scan your entire system in order to find all issues it has. 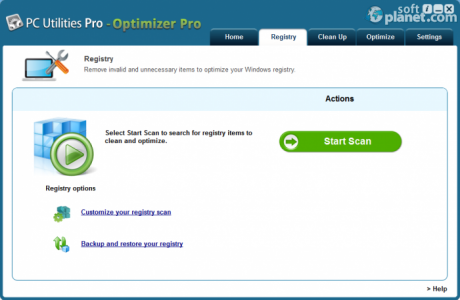 The Registry one is capable of discovering specific Windows Registry problems and fixing them. The Clean Up tab provides you with a few sub actions like Privacy clean up, Residual clean up, Fix shortcuts and Manage startup. Like I said earlier, the action buttons make this software that intuitive. The Optimize tab gives you access to several options as well such as Optimize system, Optimize system, Optimize Internet and Optimization report. The last tab allows you to get the maximum benefits from Optimizer Pro 3.2 by customizing the settings in order to meet your requirements. The application works very smoothly. Its performance made me a very good impression. It managed to scan the entire system and to find hundreds of issues within a few seconds. There are not many software utilities, which can boast achieving such results in such a short time. Unfortunately if you want to fix all problems found, you need to register your software. Otherwise, you are only able to find issues, but they will stay exactly where they are now. 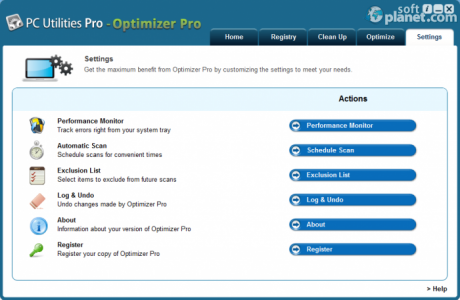 I am aware that there are lots of software applications similar to Optimizer Pro 3.2. However there are not many, which can boast such an impressive performance level. This utility comes with lots of features, which are put inside a great and well-structured interface. 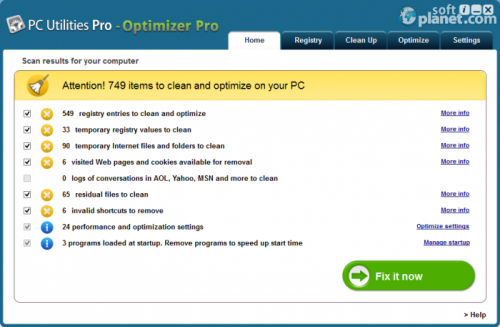 So if you want to speed up your PC by cleaning the trash, you will probably need software like Optimizer Pro 3.2. Our security scan shows that Optimizer Pro is clean from viruses. 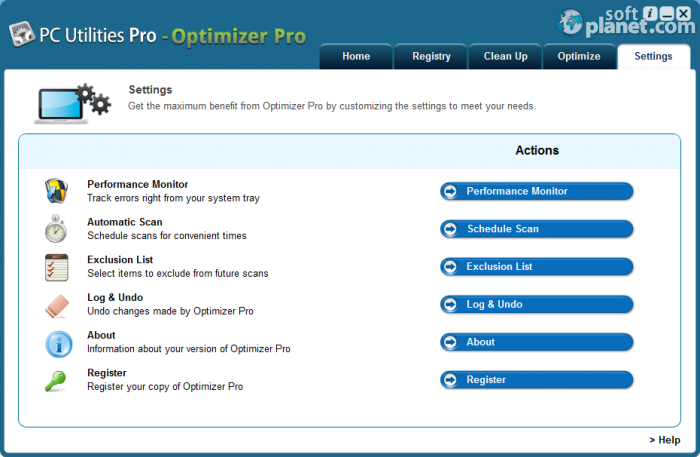 The current version of Optimizer Pro has been scanned by our system, which contains 46 different anti-virus algorithms. That ensures that Optimizer Pro 3.2 is 100% safe for your computer.